Many seniors resist using a cane because they don’t want to appear old or frail. 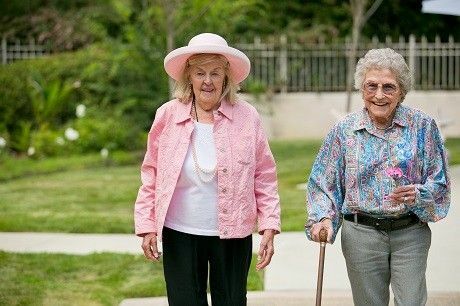 A common issue we see among seniors is using the furniture in their homes to stabilize themselves when walking. They move from chair to couch, countertop to the wall, and build a network of furnishings to move about their home. This can be a real problem when your parent ventures out of their home or moves into an assisted living community. Throughout our Aegis Living communities, we have installed decorative wainscoting that also functions as a handrail for residents to use as they walk down our hallways, for extra support. If your dad or mom is off balance or limping, consult with their physician about using a cane or a walker to help steady them on their feet. A second issue we find is the improper use of their cane. If the cane is not being properly used or is ill-fitted, it can’t help an unsteady individual. It can sometimes serve as a false sense of security if not used correctly and sometimes, even contribute to a fall. 2. As you take a step with your weak leg, bring the cane forward at the same time. 3. Lean your weight through your grasp holding the cane for extra stability. Keep your head up and don’t look down at your feet. 4. Always have the weak leg assume your first weight-bearing step on a flat surface with the heel first. Try to keep a natural step length and pace when walking. 5. The cane should move the distance of an average step forward. With each move forward, you should not be stepping ahead of the cane. 6. If you are using the cane for general mobility (rather than an injury) hold the cane in your dominant hand to bear the most weight. 7. The length of a cane is important. The cane should fit so the handle falls comfortably into the palm of your “good” side or dominant hand when relaxed with the elbow slightly bent. If your cane is too high, this can hurt your shoulder and if it is too low, it can cause you to slouch over. The American Physical Therapy Association (APTA) suggests that any senior who uses a walker or cane should be properly assessed and fitted by a physical therapist to avoid falls. If your parent is working with a physical therapist, they may have a specific plan or directions for use of their cane that is different from these instructions. Always refer to their doctor or physical therapist if you have questions about their stability.